The Bologna motor show is the largest in Italy, with more than 700,000 visitors each year, and Italy is a big automotive market with more than 2 millions new car sales each year. 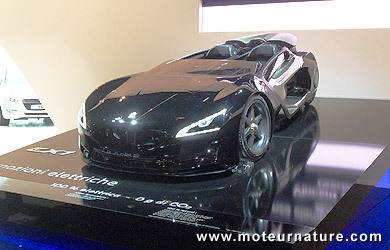 But that might not be enough to car manufacturers, as there were few world premieres in Bologna. The revamped Opel Corsa was one of them, the Ferrari 458 Challenge was another one, definitely not a green car, but electrics were plentiful, like the white Renault Fluence on top of this page, or the purple Citroën C-Zero above. An electric Fiat Panda (small red car above), not available from Fiat but from a third party, was available for test-drives and that was the best part of the show. 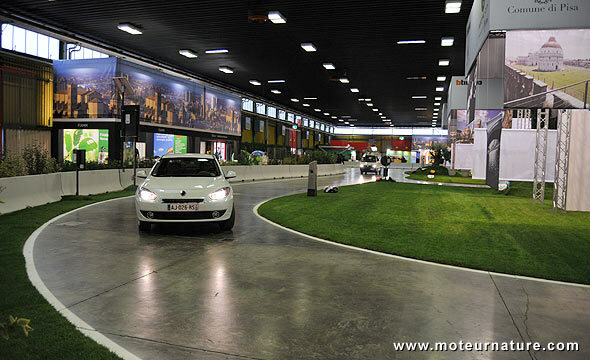 A large indoor circuit had been set-up, all indoors, and many electrics were available to anyone with a driver’s license. 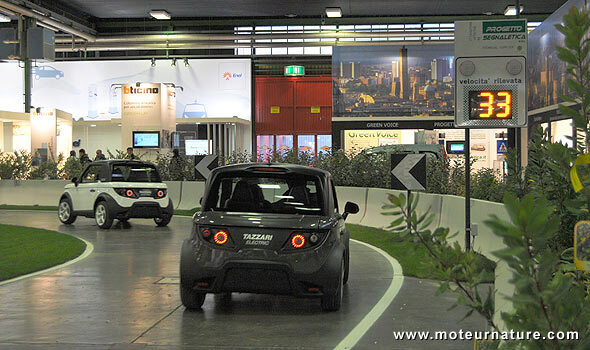 Two Tazzari Zeros are above, a micro-size electric car, it’s about the same size as a Smart, and it costs about 30,000 dollars in Italy. A bit pricey, but at least it’s available. The electric scooter from Smart isn’t. I had seen it at the motor show in Paris 2 months ago, and there’s no doubt it’s the best electric scooter I’ve ever seen, but it’s still waiting for the green light to go into production. The best car of the show was without any doubt the Peugeot EX1 (left). 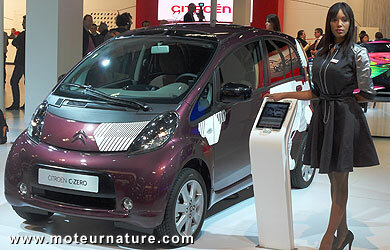 Actually, the EX1 is not new, it was introduced last September, but Bologna was its first motor show. A very ambitious electric sports car, it’s a one-off prototype, intended to look fast, and to go faster still. This coming at the expense of everyday’s usability. The car has been clocked going from 0 to 62-mph in 3.6 seconds, but it doesn’t have a roof nor a windshield. This makes it light, but you have to drive with a helmet on, and how do you enjoy a silent zero-emission sports car like that?